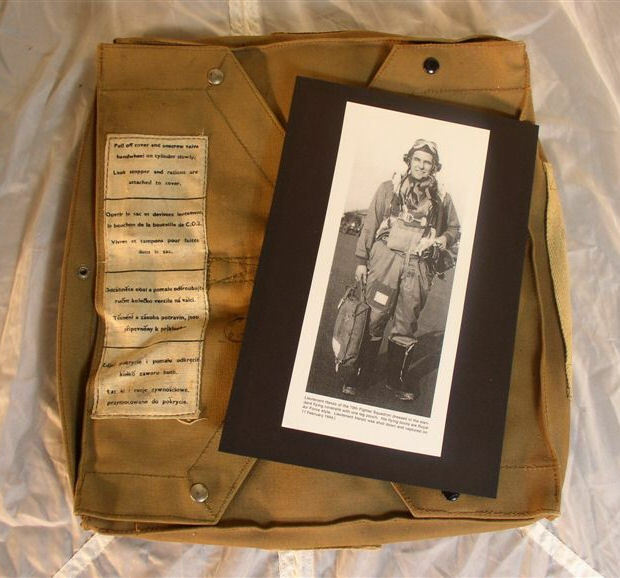 (F-1) Shown above is one example of what fighter pilots wore late 1943 into the first half of 1944. My figure is based on the many pilots of the 20th and 55th FGs. 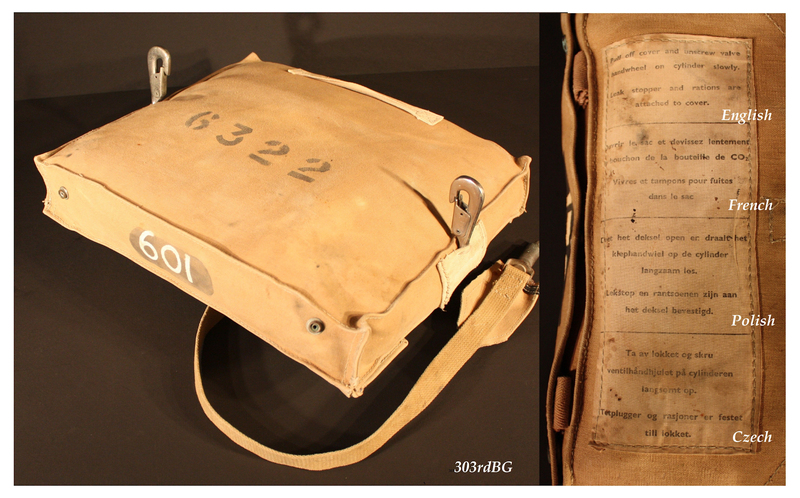 The RAF first aid kit shows up in the 20th and 364th FGs and possibly more. 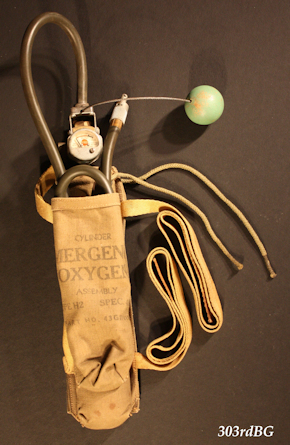 The RAF first aid kit did not replace the standard issue first aid kit tied to every parachute, but was an addition. 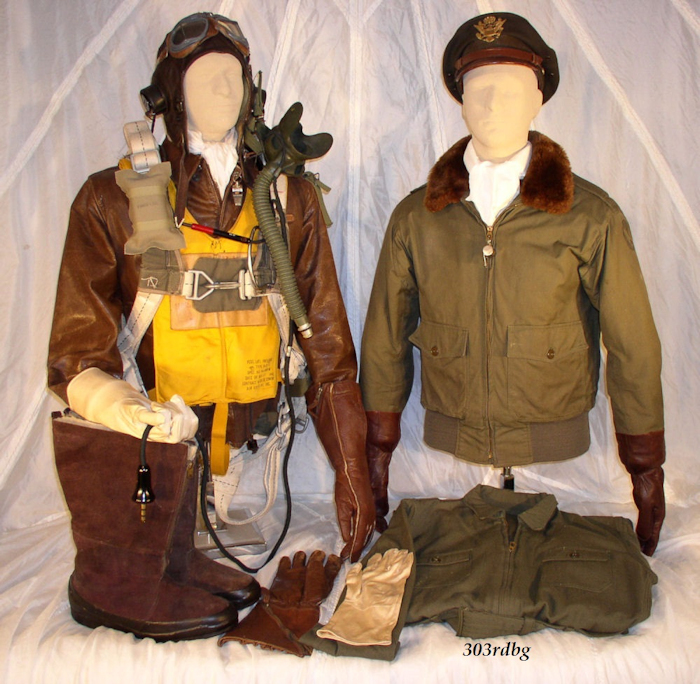 Additional RAF items shown above are the 1940 pattern flying boots, the white silk gloves worn under the 1943 pattern gloves and the RAF 1942 pattern type C helmet. 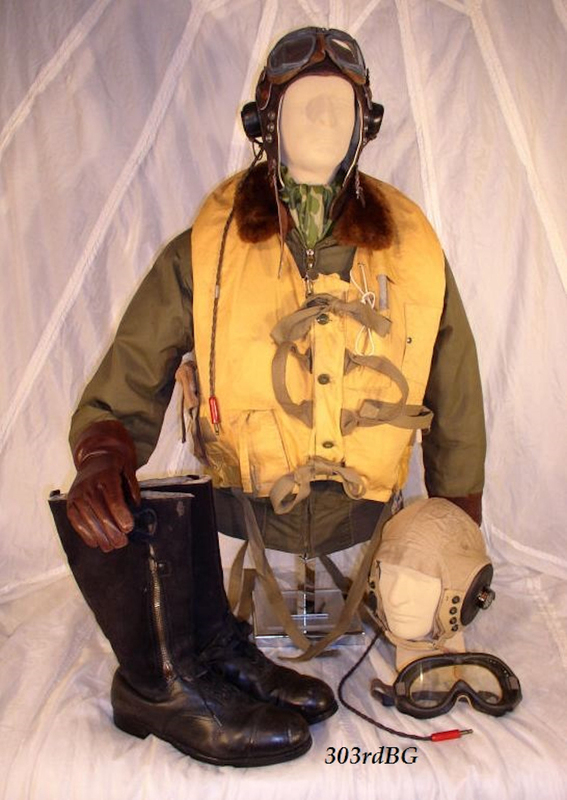 The other items are U.S. issue: The tanker jacket and pants/coveralls (shown folded in front), the B-3 life preserver, the B-8 parachute with the U.S. issued first aid kit, the AN-6530 goggles, the A-14 oxygen mask with T-44 mic installed. Plus one more RAF item, the AM (Air Ministry) marked whistle. Several of these items are shown in more detail in the photos below. 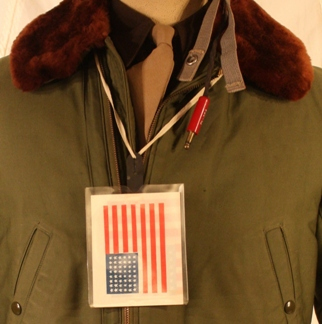 (F-2) Shown above is the Tanker Jacket or Combat Jacket. The name "tanker jacket" seems to be the term mostly used. It was warmer than the A-2 jacket and more comfortable to wear. 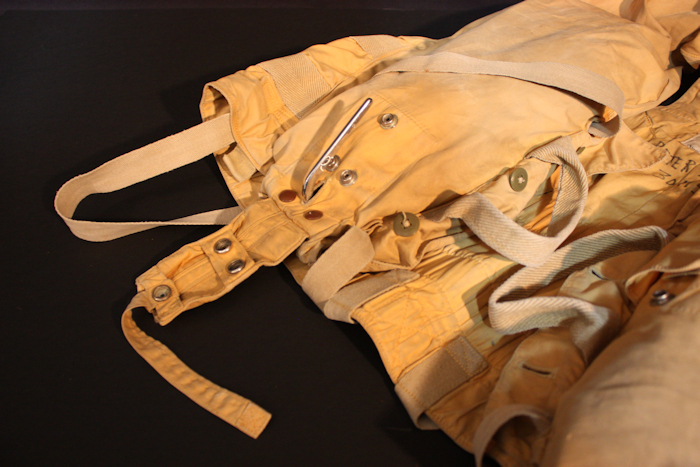 The jacket and pant/coveralls were made of the same material and had the wool blanket type lining. Its use decreased when the B-10 jacket and A-9 pants arrived. (F-3) Shown above are three pilots of the 55th FG. On the left is Lt. Larsen wearing the tanker pants/coveralls that go with the tanker jacket. Lt. Larsen was KIA Dec. 1944. Shown center is Lt. Garlock who was shot down May 1944 and became a POW. Shown far right is Lt. Jensen wearing the tanker jacket and pants/coveralls. 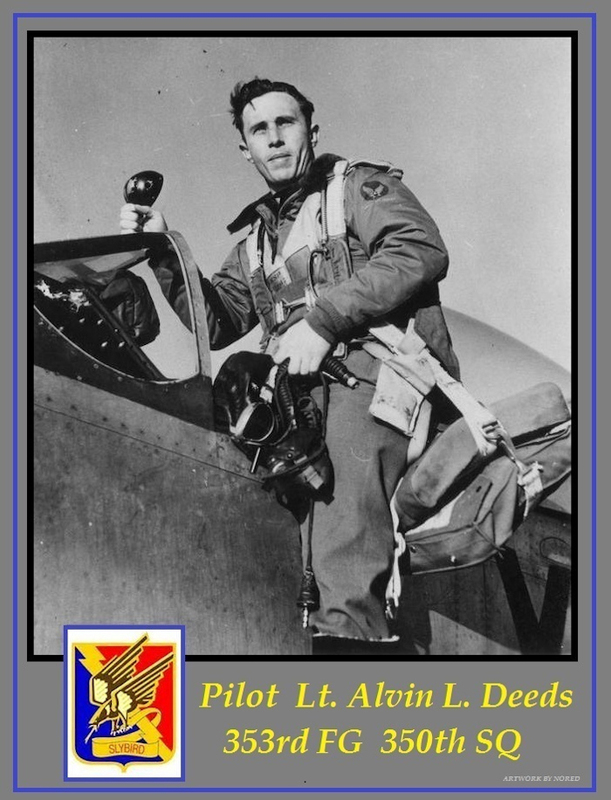 He too was shot down and became a POW in Nov. 1943. 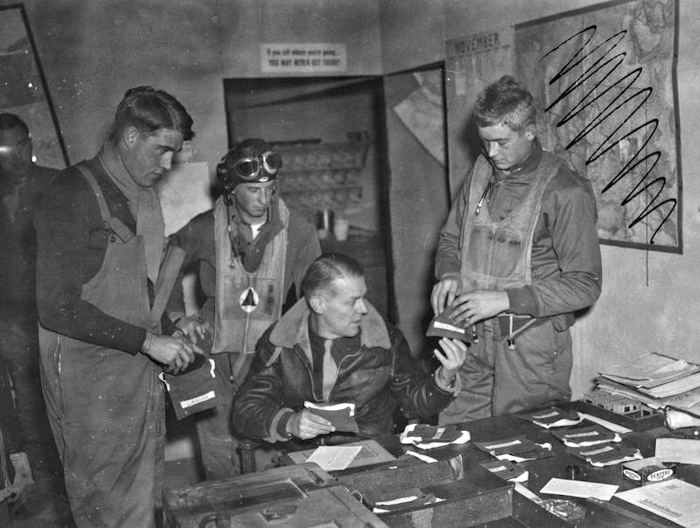 The men are shown turning in their personal items before going out on another mission. 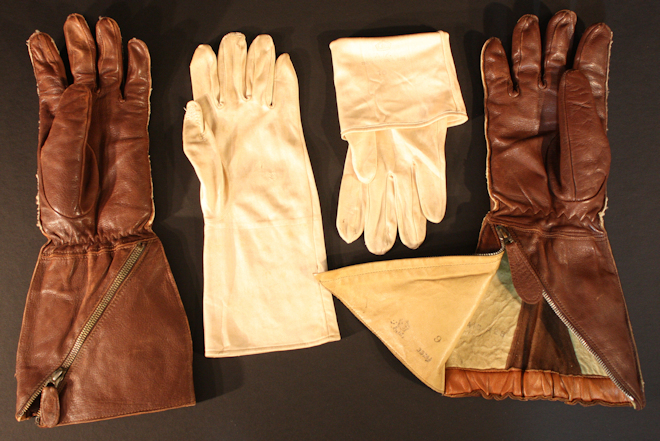 (F-4) Shown above is the RAF 1941 pattern gloves accompanied by the silk inserts. 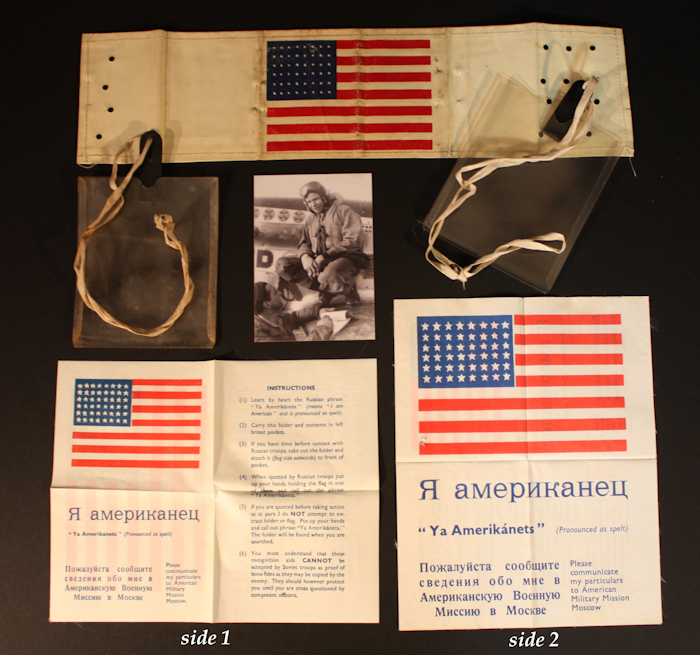 These gloves show up in a few photos of U.S. bomber crews, but were much more prevalent with U.S. fighter pilots. 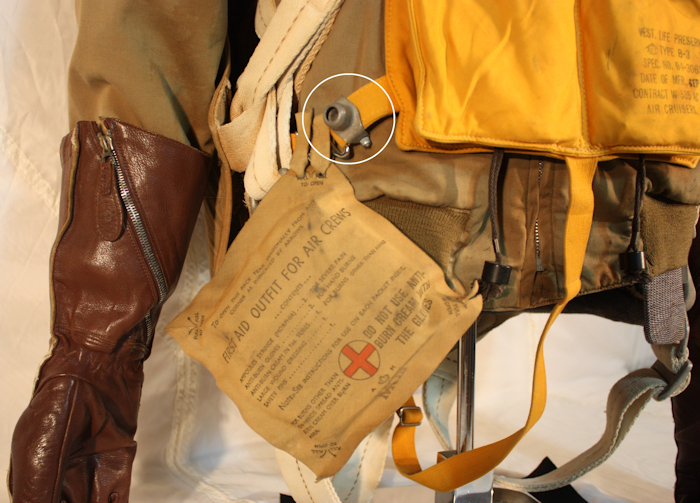 (F-5) Shown above is a closer look how the RAF First aid Kit was hung from the life preserver strap. 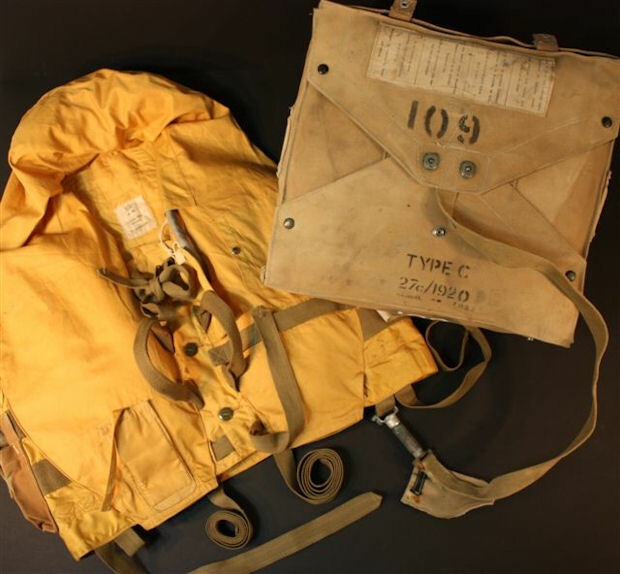 This RAF kit shows up in a few photographs, but not as prevalent as the US parachute first aid kit. One can only speculate on how or why some of these kits wound up in some of the fighter groups. Also in the photo, the connection point for the life raft is shown clearly. 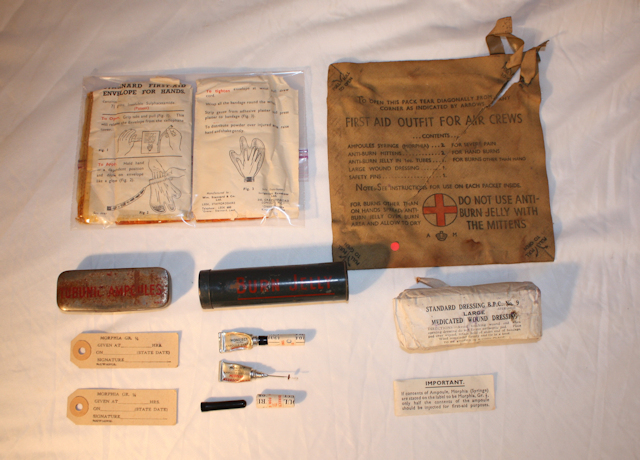 (F-6) According to Mick Prodger's excellent book "Luftwaffe vs. RAF: Flying Equipment of the Air War, 1939-45", there were 3 variants of the Aircrew First aid kit -- The Mk I, MkII and MkIII. The one kit displayed on my fighter pilot is stamped MkIII. The one shown above has no markings. The only difference is the printing of contents. One refers to the anti-burn gloves as mittens while the other kit describes them as gloves. Either way, both kits contained the following: 2 morphine syringes / 2 anti-burn mitten-gloves / 1 tube of anti-burn jelly 1 oz. / 1 large wound dressing / and 1 safety pin. 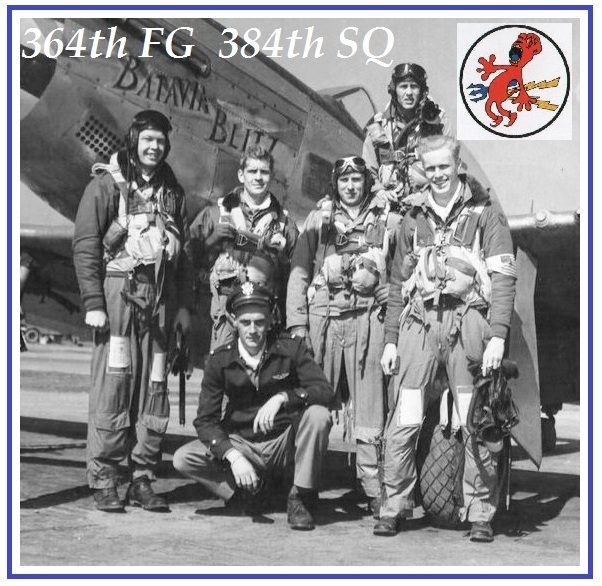 (F-7) Shown above is a an excellent photo of a group of 364th FG pilots. Shown circled are the RAF first aid packets. The pilot on the far left has a hose extending from the waist. That hose is from the anti-G suit Type G-1 or Type G-2. War Time G suits are very rare to find. For you beginning collectors, I will make this a test photo. I'll simply list the items in photo and you find them: A-11, Type-C's, AN-H-15, B-8's, A-14's, B-2's, B-8's again, B-10's, M-3's, B-4's, AN-6550/AN- S-31A "Crusher" and P-51 (Further down this page is a second group of pilots from this same FG SQ). (F-8) Shown above is Capt. 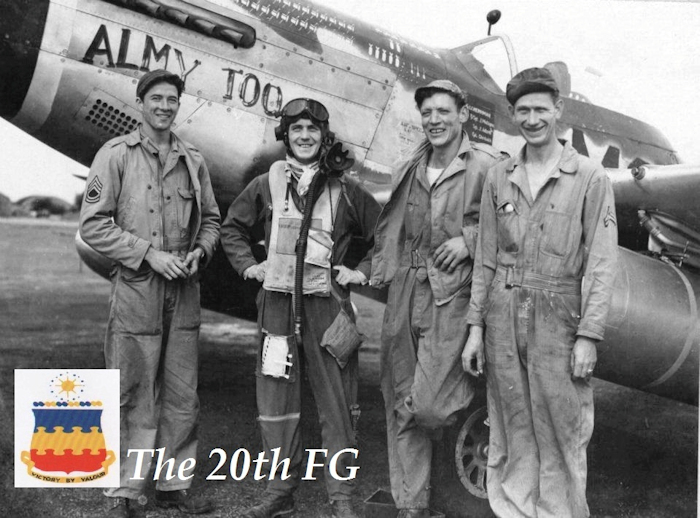 Merriman of the 20th FG 79th SQ, posed with three of his ground crew. The RAF First Aid Kit is hanging from the waist strap of his B-3 life preserver. A Life Jacket Dye Marker packet is hanging on the front of his B-3. He has fixed a hose extension to his A-14 mask. His flight suit looks like the A-4 with a zipper added to the lower right leg pocket and like most of the fighter pilots, additional straps or pockets have been added including the one on his lower left leg which has what looks like the Army M-3 trench knife. Note the varied mission symbols on his plane. 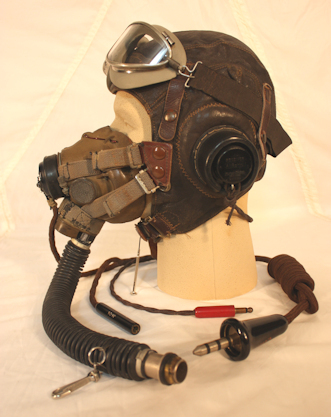 (F-9) Shown above is the early RAF type B helmet with the RAF MK IV B goggles. (F-10) Shown above left is the POLAROID ALL-PURPOSE GOGGLE No.1021. The goggles could be found, as its description "ALL-PURPOSE" implies, on anyone and everyone needing a goggle including bomber crews and fighter pilots. They do show up on flight crews early in the war, but are soon replaced with the better options. 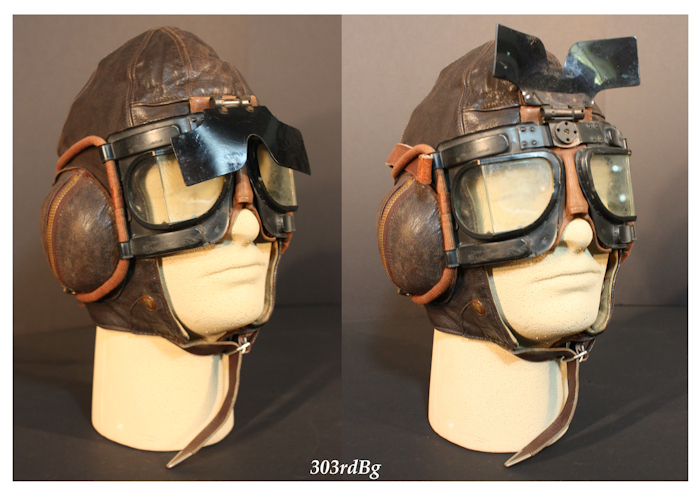 In the above photo on the right are the RAF Mk VIII goggles. The Mk VIII's were very popular with fighter pilots, to say the least. The Flight helmet is the RAF 42 pattern C helmet. (F-11) Shown above left and right are the B-7 goggles topping off the AN-H-15 summer helmet. 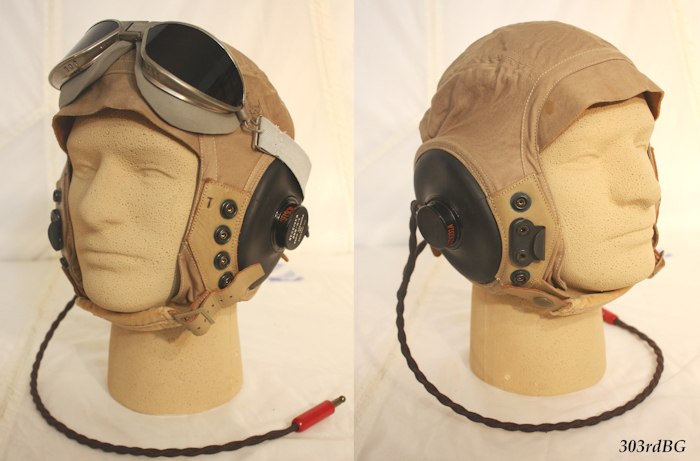 It is rare to find a bomber crew, B-17 or B-24, wearing this helmet. (See Joe Vieira Salute on the F-2 page as an exception.) 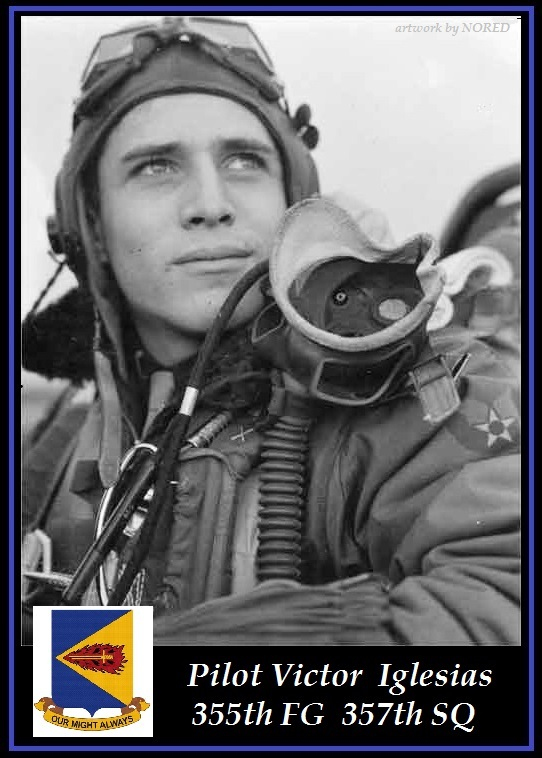 Among fighter pilots based in England, most pilots flew wearing the C helmet or A-11 helmets. I would estimate its use was less then 10% among fighter pilots. (F-12) Shown above left is the B-8 goggle on top of an A-11 helmet, used by both bomber and fighter pilots. It shows up in plenty of photos. On the right is the more rare early RAF goggle the MkIII. 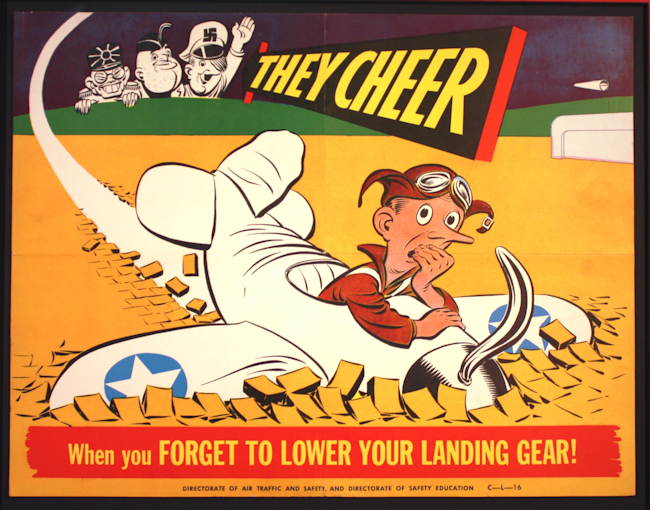 Developed in the Mid 1930s, it appears sparingly early in the war on fighter pilots. They do appear on some of the 56th FG pilots. 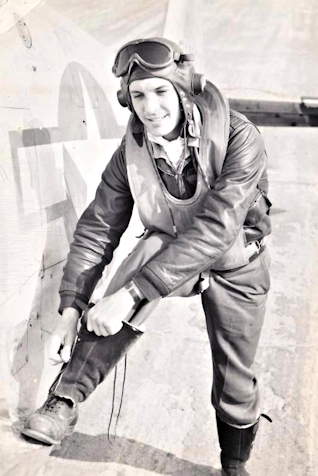 (F-13) Shown above is Lt. Lamb of the 56th FG. 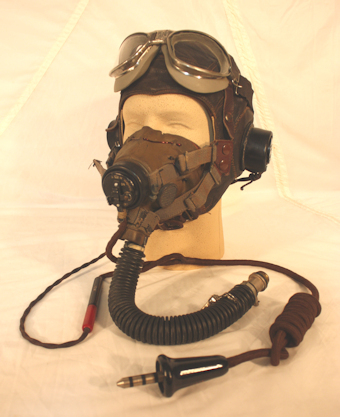 His oxygen mask is the RAF Type E. This mask was used for a short period before switching to the RAF type G mask. The Lt. also wears the 1021 goggles on top of the C helmet. (F-14) Shown above. Lt. Griffith is wearing the RAF MK VII goggles. (F-15) Shown above is the RAF type C 1942 pattern with B-7 goggles. 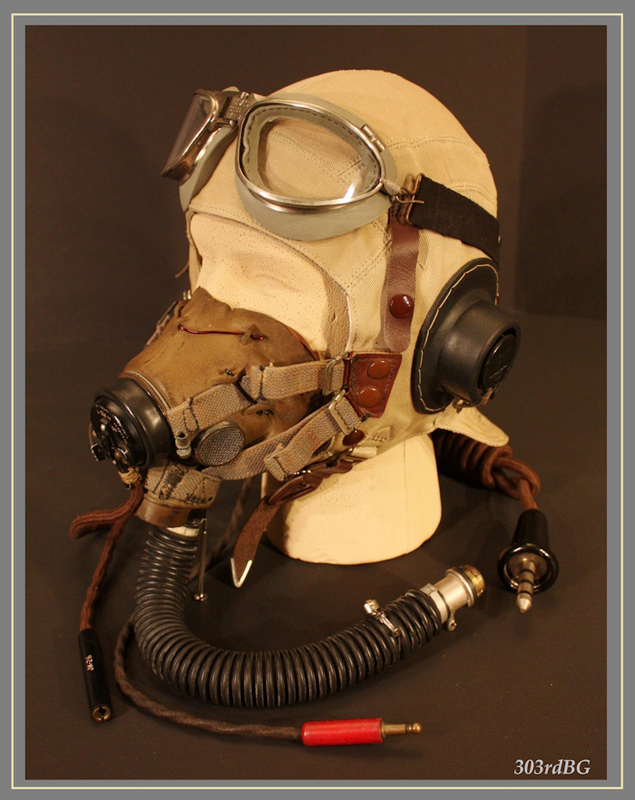 The O2 mask is the RAF type G mask, the exact set up used by Gabby Gabreski, Bud Mahurin and many others of the 56th FG. (F-16) Shown above is the T-44 mic, shown both, installed in the A-14 mask and new out of the box. The T-44 is very easy to install. Instructions are included. It's installation is similar to that of installing the ANB-M-C1 mic. (F-17) Shown above is a great example of how chamois was applied to the A-14 mask. Some pilots had this applied and others didn't. It was a personal preference. The pilot shown is Lt. Iglesias of the 355th FG 357th SQ. 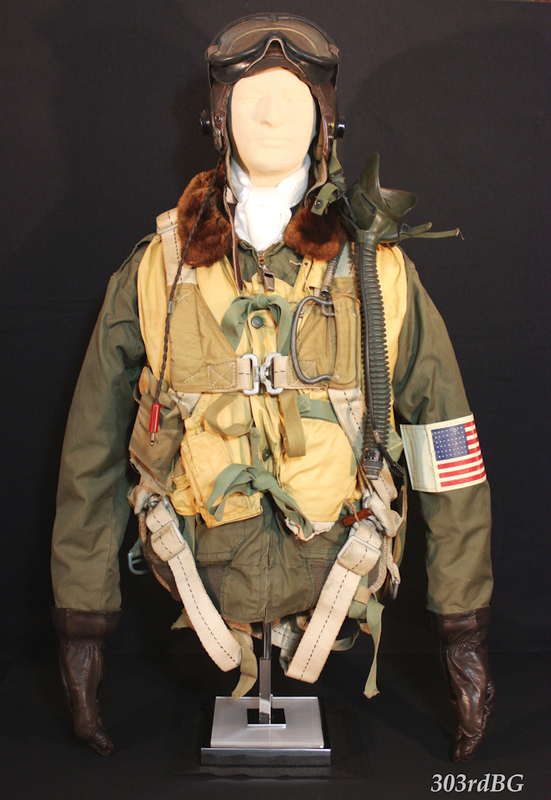 Other items shown utilized by the Lt. is the T-44 Mic, the B-10 jacket, A-11 helmet with Mark VIII goggles, the 41 pattern RAF gloves and a B-8 parachute with unpainted rip cord handle. The other chrome like item is the whistle. (F-18) Shown above is Lt. Col. John Ferguson of the 62nd Sq., 56th FG. Note broad white stripes on the wing of the P-47. The presence of these "invasion markings" dates this photo. It was taken on or after June 6th, 1944. Ferguson flew with the 56th from June 1944 to Feb. 1945, 70 combat missions in all. This is a signed photo and despite John's signature across the front of the photo the clarity is excellent. 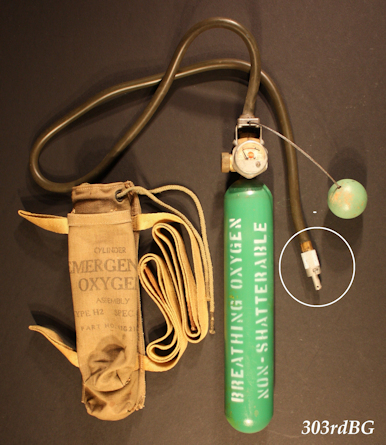 Shown above and below is the H-1 Emergency Oxygen bottle or "Bailout Bottle" as most refer to it. This item shows up for a brief period with the 56th FG. Photos of Gabreski (shown above), Gerald Johnson and Paul Conger have the H-1 tied on to their parachute harness. The H-1 shows up in just a hand full of bomber crew photos and then it simply disappears. The bottles weigh about as much as a brick. Straps are provided on both the H-1 and H-2 so you can tie it to your leg. 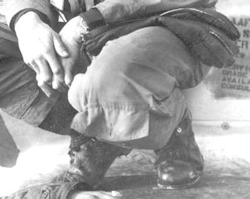 In the handful of bomber crew photos I've seen, they have it tied on below the knee, or they have it in the lower pocket of the A-3 pants, and in one photo it had been slipped into his RAF boots. Crews wearing heated suits couldn't tie the bottle on tight enough with out creating a "hotspot". I can only speculate that bail out bottles found themselves in the kit bags. Shown above is an early 1943 photo of a 91st BG crew where two H-1 bailout bottles are present. See circled items. Note early RAF B model flight helmet on one of the men. 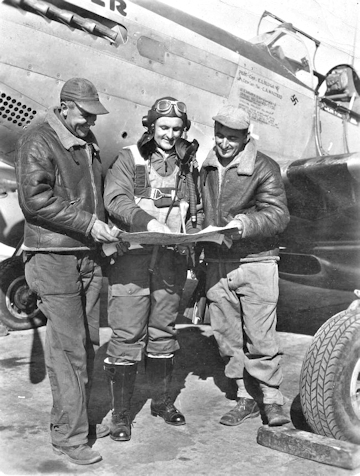 (F-19) Shown above in the popular photo is L-R Major Peterson, Major "Kit" Carson, Major England and Major "Bud" Anderson. There all wearing the A-2 jacket. They all have MK VIII RAF goggles and RAF type C helmets. England has a 42 pattern the rest the 43 pattern. England has a B-4 Mae West the rest have B-3s. Peterson has a camouflage pattern scarf from a parachute. Anderson has the T-44 mic installed in his A-14 mask, Carson does not. Anderson has his receivers of the C helmet taped in the others do not. 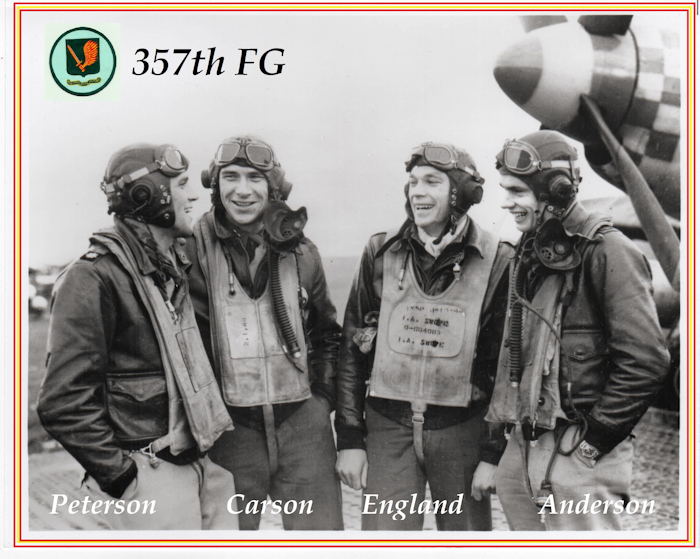 These 4 gentlemen were the top scoring aces of the 357th. . Anderson has a very nice website worth visiting at www.cebudanderson.com. 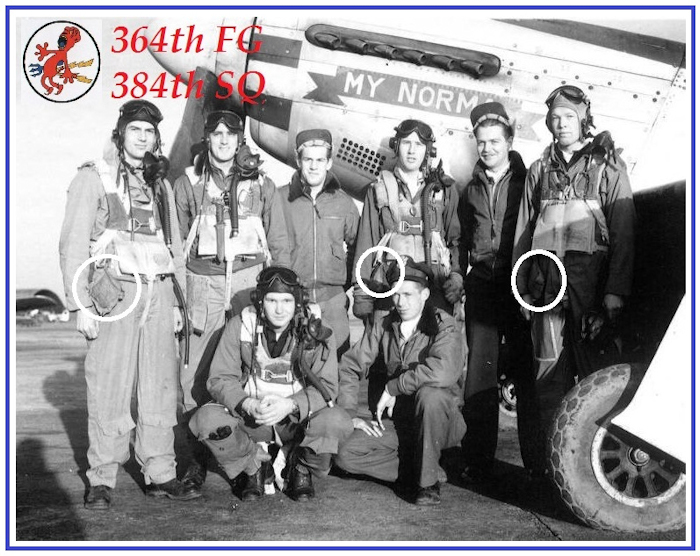 (F-20) My figure above is based on the many items you see in this popular photo of the 364th FG shown below. I speculate photo was taken sometime in the last 6 months of the war. 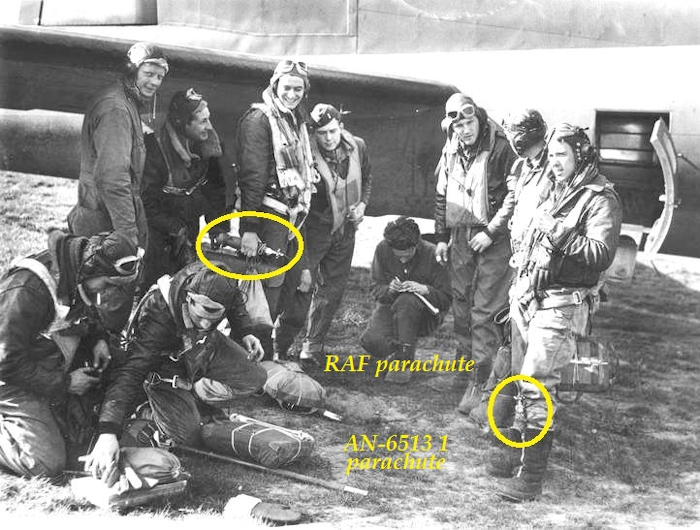 One of the items that dates the photo are the 2 B-8 parachutes with bayonet hardware. 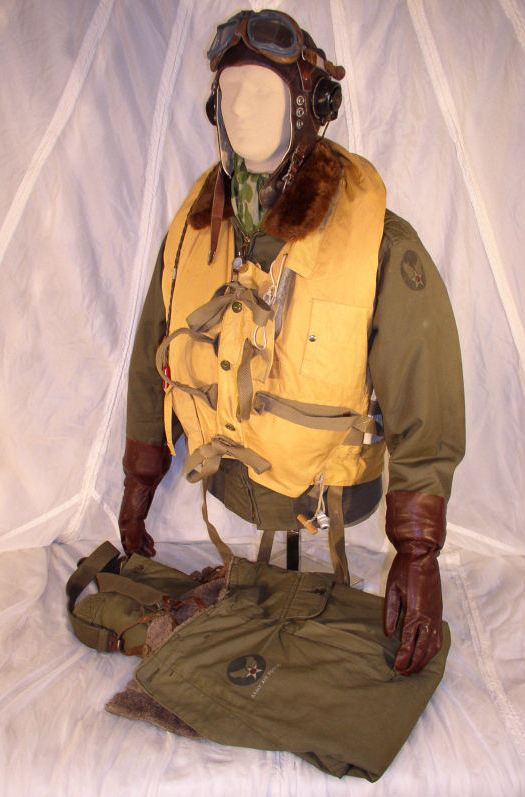 My figure above wears the B-8 parachute with Bayonet hardware over the RAF life preserver, the B-10 jacket with authentic U.S. armband, A-11 helmet, B-8 goggles and A-14 mask with ANB-M-C1 mic installed. The gloves are A-11A type. In the photo below the flying suits are the AN-6550 and/or AN-S-31A types. Shown above left is Lt. Col. Righetti on the wing of his Mustang "KatyDid." See figure and caption below. 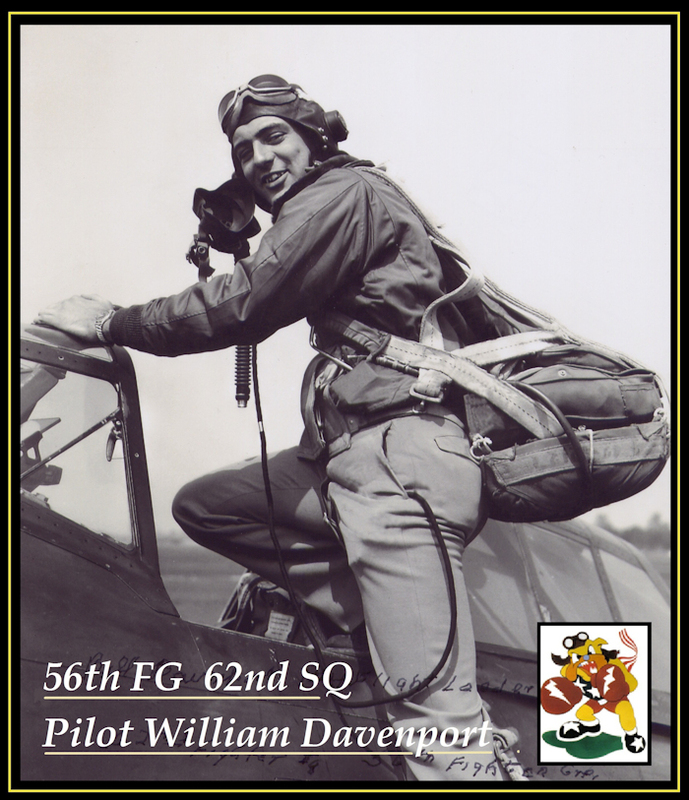 Above right is Lt. David Stewart of the 20th FG, 79th SQ. 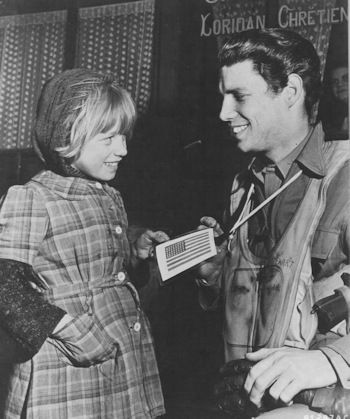 He is showing his U.S. flag I.D. to a French girl after being shot down over France. 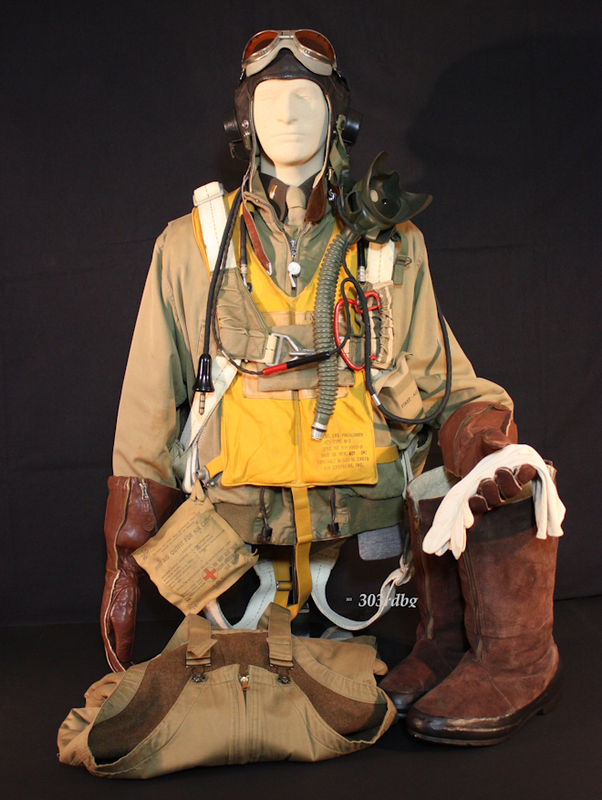 (revised caption April 16th 2018) Shown above is a reconstruction showing the flight gear of COL. Elwyn G. Righetti of the 55th FG. 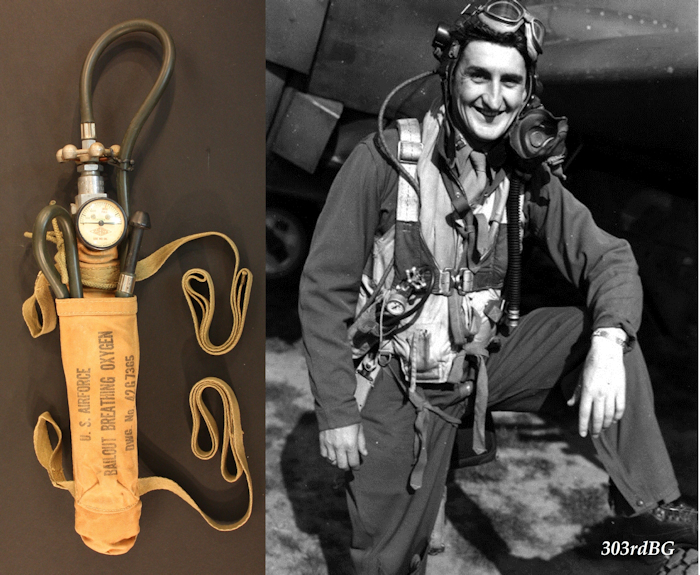 The flight gear items are based on 4 photos of Righetti, including the one above (left). As best as I can see from these black and white photos. He's wearing the 1941 Pattern RAF life vest, the 1941 pattern RAF gloves and the lighter shade AN-6550/AN-S-31A summer flight suit. 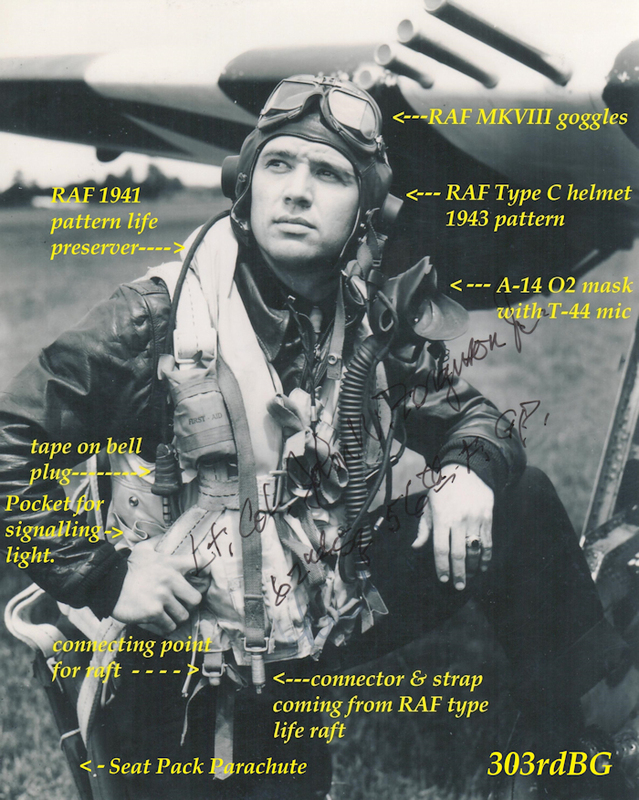 He also wears the RAF 43 pattern C helmet with white, taped in receivers and U.S. B-8 goggles. 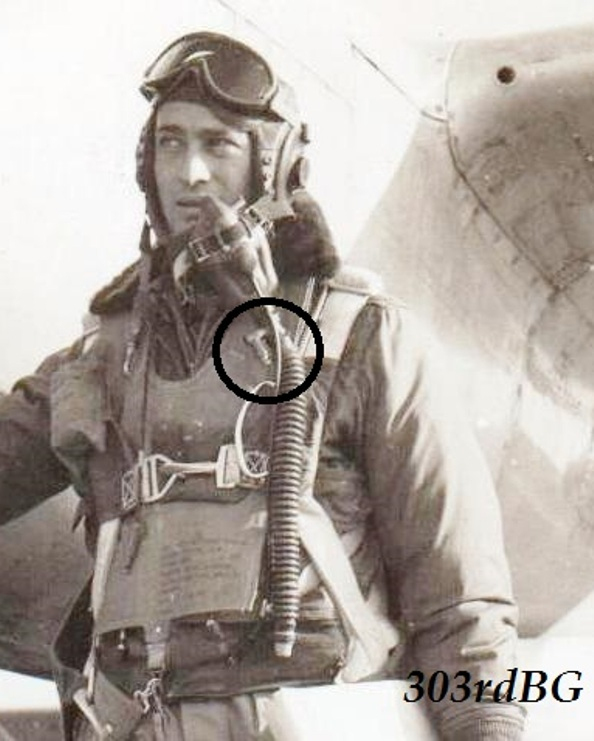 In 2 other photos of Righetti, he is shown wearing a B-15 jacket, A-14 O2 mask and B-8 parachute with Bayonet hardware. 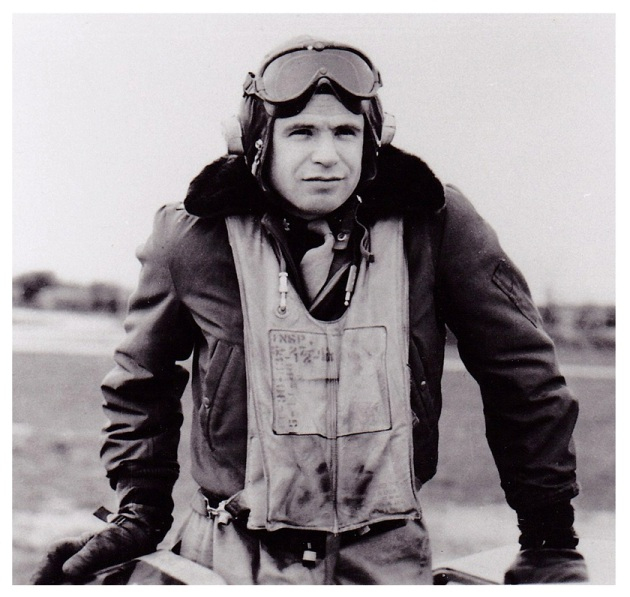 His flight gear is typical of many of the 55th FG pilots. The "Blood Chit" or safe-conduct pass ID flag hangs from his neck. All items except for the white tape are authentic. Righetti became the top scoring strafing pilot. On the 17th of April, 1945 he was shot down near Dresden. He survived a crashed landing. All evidence suggest that he was killed by angry civilians shortly after. Aviation artist Robert Taylor did a great painting of his plane "KatyDid." It's a great print. In searching for small details in photos, it's a good idea to enlarge the area. Then, play with the contrast to bring out a visual clue that helps to identify the object. Based on what I can see, Righetti is wearing the RAF designed "escape boots". He has his pant leg tucked into the boot and the flight suit pulled down over the out side of the boot. 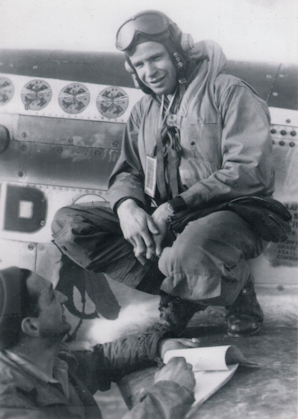 Shown above is Commander of the 55th FG, Elwyn Righetti, standing in the cockpit of his plane. Thanks to author Jay A. Stout who provided us with the photo. Presented above is another recreation showing the variety of flight gear worn by Col Righetti. He wears a B-3 life preserver over a B-15 jacket. Note the connector on the B-3 strap for the RAF Dinghy. The gloves are the A-11 type with wool liners. Helmet and goggles are the same ones described above. The model above is based on a large photo shown in Flight Journal magazine April/May 2018 issue and photo is also used on the cover of the new book about Righetti authored by Jay A Stout. 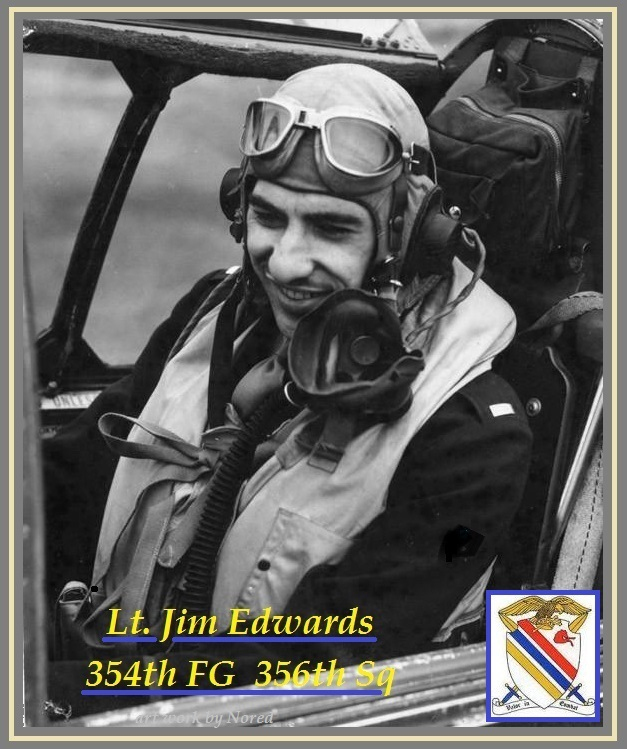 (F-21) Lt. Edwards shown above is wearing the RAF type D helmet, made of canvas material not leather. Lt. Edwards flight gear looks like it was just issued. He wears the B-7/6530 goggles, 41 pattern RAF life preserver and RAF type G O2 mask. 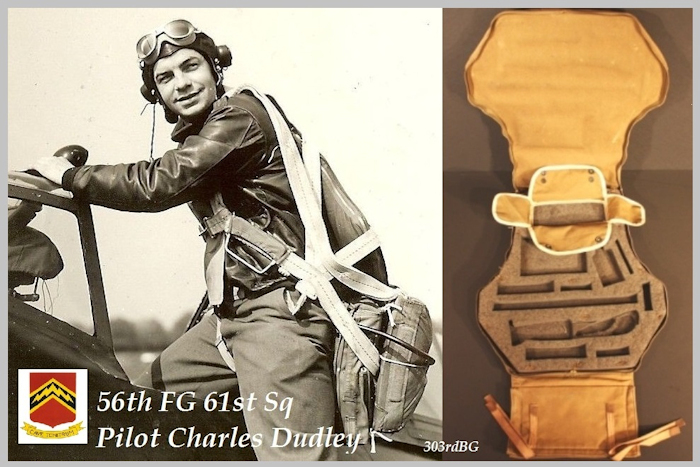 An example of the first aid kit seen hanging behind him can be seen on the FLAK/ Misc page of this site. 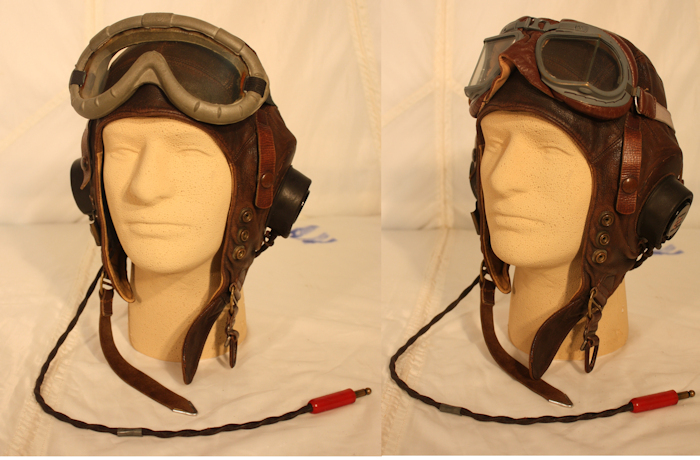 Below is a recreation of Lt. Edwards head gear as seen in photo. (F-23) Above are two nice examples of the AAF logo stamped on the sleeve of the B-10 and a very rare example of a pair of A-9 pants with the logo. The American-made B-3A gloves are very thin and more like a women's glove. If I was a pilot concerned about keeping my hands warm and trying to better protect myself against potential fire, I'd be wearing the RAF gloves. You should also note the two handles sticking out of the RAF life preserver at the lower chest. Those are grab handles to pull a man out of the water. 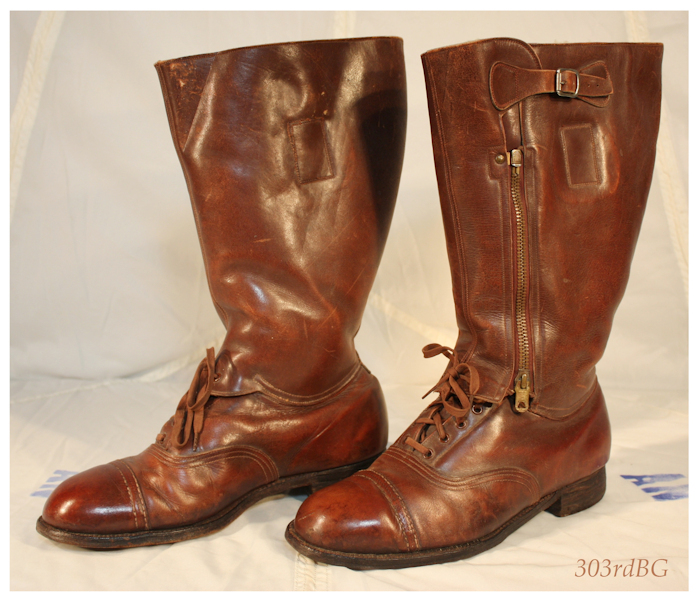 In my search to find the best authentic war time photos that best represents the items displayed, I started seeing boots I took for granted were the RAF 1936 pattern flying boots. But they turned out to be the escape boots with leather uppers instead of the black suede. I consulted Mick Prodger and he was kind enough to provide the following story and information about escape boots. 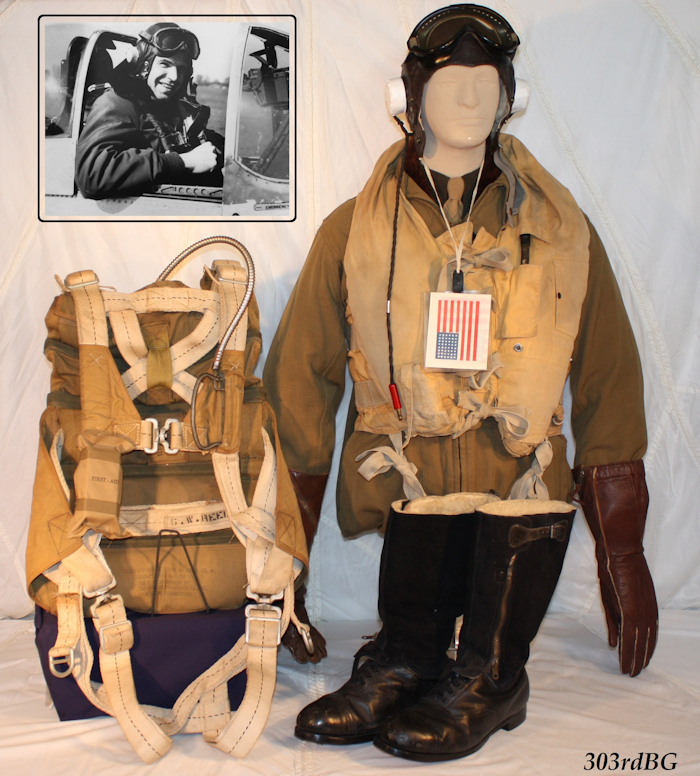 Mr. Prodger has a great website if your seeking items of WWII flight gear for your collection. 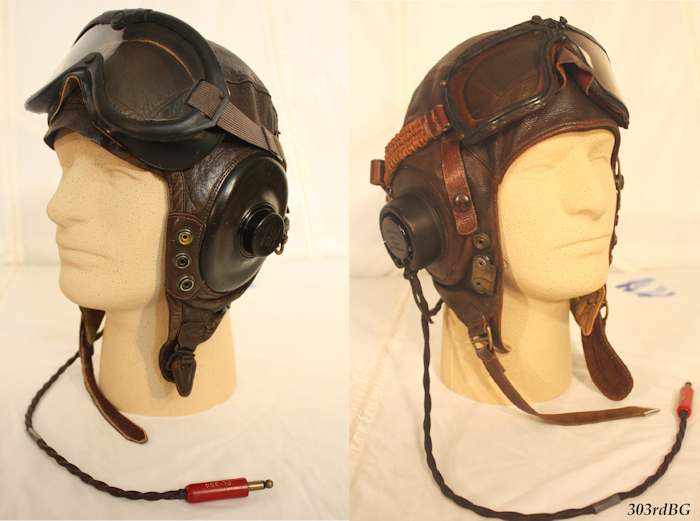 See: www.vintageflyinghelmets.com. Thanks Mick. "Here�s the story: When Clayton Hutton at MI9 proposed his idea for the escape boots, he was told by the Air Ministry there was no budget for such a frivolous item. A wealthy businessman (the founder of Morris Motors), Lord Nuffield, thought it a great idea and offered to finance production for the first few hundred pairs on condition that the Air Ministry would look again if they were successful. They agreed. 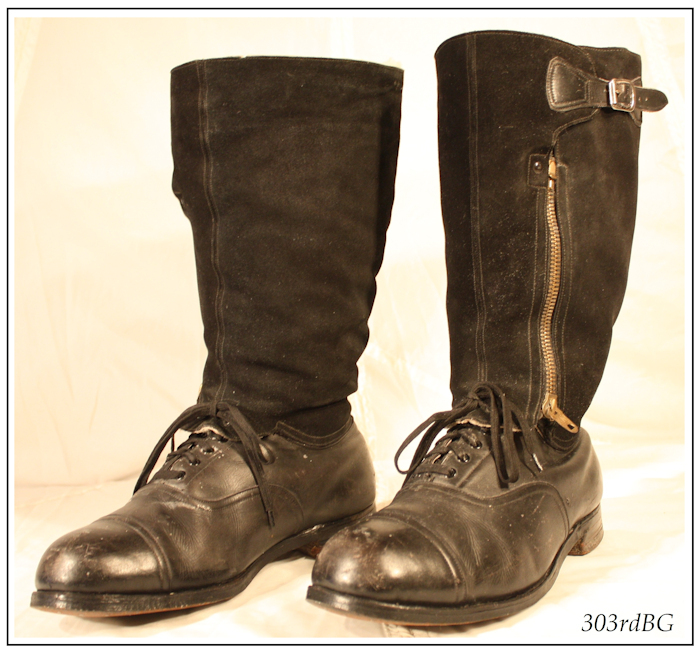 The first few hundred pairs were made of all leather and had the zipper down the front of the boots. After a while, they received comments that the zipper kept getting in the way of the shoelaces, so they moved it around to the outside of the boot. The test boots were very successful and popular with aircrews, so the Air Ministry relented and agreed to accept the design. They changed the uppers to suede to keep the cost down and they were officially announced in 1943 (hence the name 1943 pattern escape boots). They remained in production and were issued until the mid-1950s. While the suede ones are quite common, the all leather ones are much less so (either with front or side zipper)." 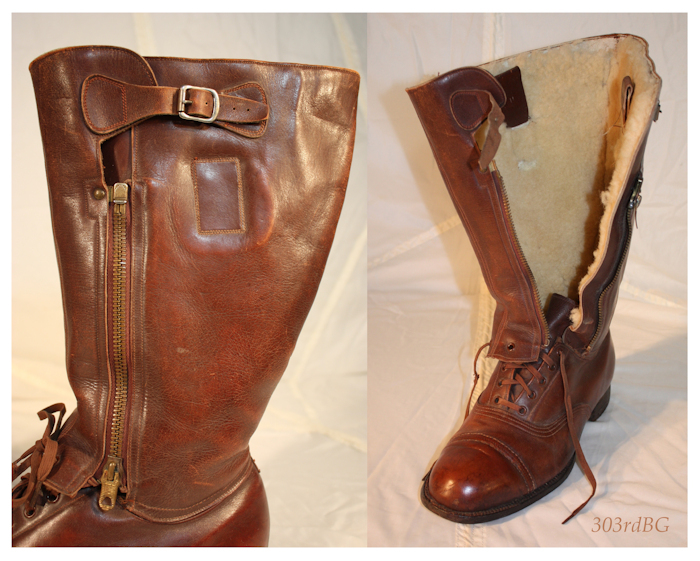 "In addition, several USAAF airmen went to the manufacturers and had identical boots made in brown leather (all leather, no suede) to comply with AAF dress regulations. Those privately purchased brown escape boots do turn up once in a while, but I think those in your photo are black." (1) Shown above are three pilots from the 56th FG. L-R Captain Donald Renwick, Lt. Norman Brooks and Captain Francis Gabreski. Gabreski is wearing an early version of the escape boots with the zipper placed on the front of the boot. Photo taken in 1943. 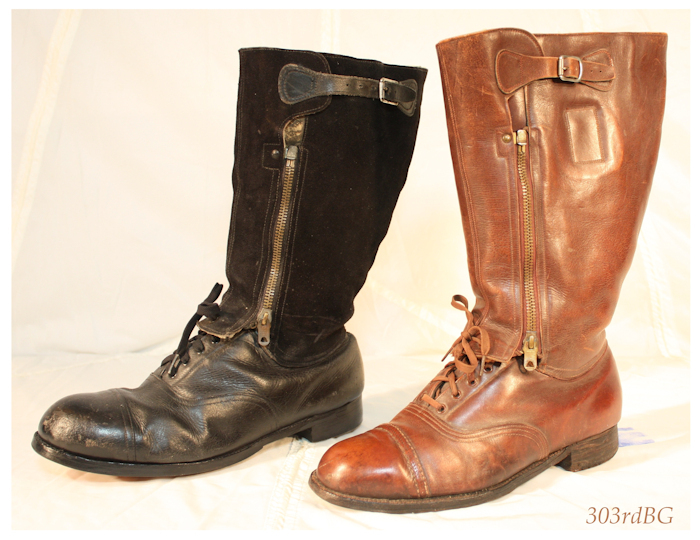 (2) Shown above is the second version of the all leather Escape Boots. The zipper has been moved to the side. This is the first pair of these I've been able to purchase and they are in beautiful condition. (3) Shown above left in more detail is the zipper, buckle and square, sewn "box" pattern which is on both sides of the boot. 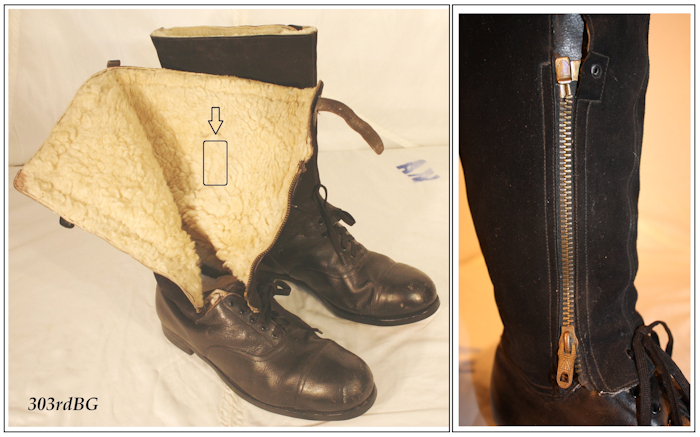 Their presence are from the placement of leather pull straps sewn to the interior of the boot on both sides, as seen in the right photo. I detected no hidden pouch for a knife in either boot. The name on the zipper pull is Lightning. There is no AM or "arrow" present. (4) Shown above is the 3rd and official version of the escape boots created by the Air Ministry. As mentioned earlier, the Air Ministry has utilized the black suede for the tops instead of leather. 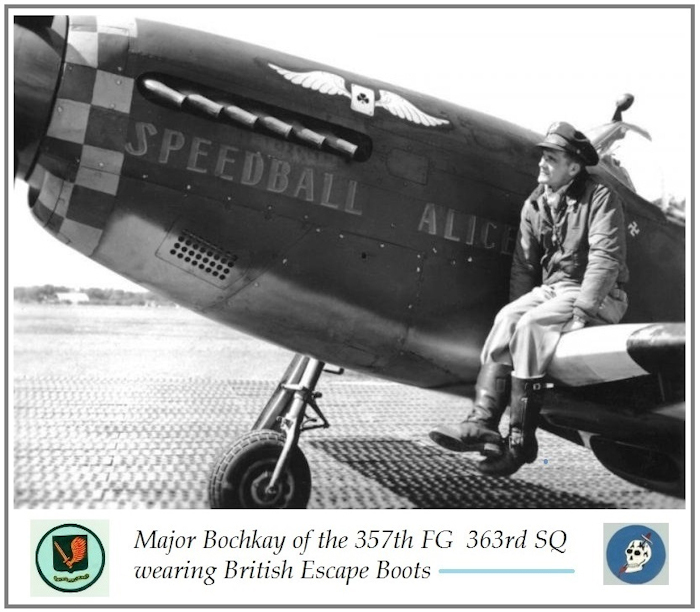 You can find photos of fighter pilots wearing these boots in the 20th, 55th, 56th, 78th, 352nd, 355th, 357th and the 361st fighter groups. (5) In the above left photo I have outlined the location of the pocket or pouch that held the small flat knife. At this time I have no example of the knife to display. Upper right is a closer look at the zipper. (6) Shown above for comparison. The first version of the all leather escape boots came in black leather also. The zipper pull on the boot with the black suede reads Lightning and has the broad arrow stamped on the opposite side. (7) Examples of the escape boots with leather uppers (marked A) and black Suede uppers (marked B) can be seen in the above photos. Note pilot on upper right is wearing his "G" suit. Note U. S. Armbands. Unit designation is on the bumper of each jeep. 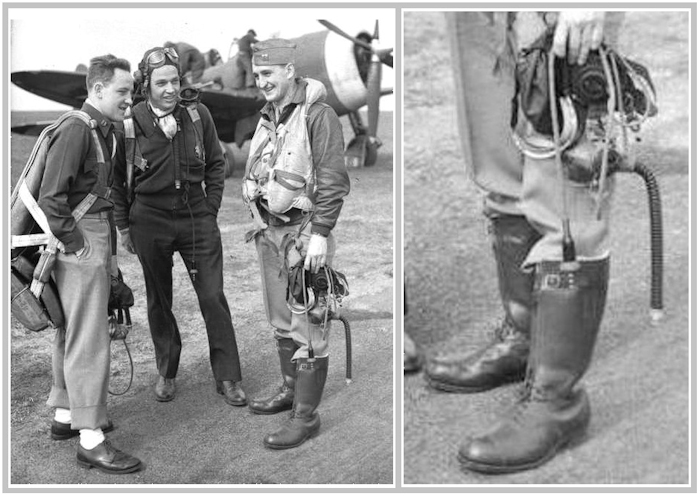 (8) Shown above are two examples of the 1943 pattern flying/escape boots being worn by (left) Lt. Sluga of the 355th FG and (right) Capt. 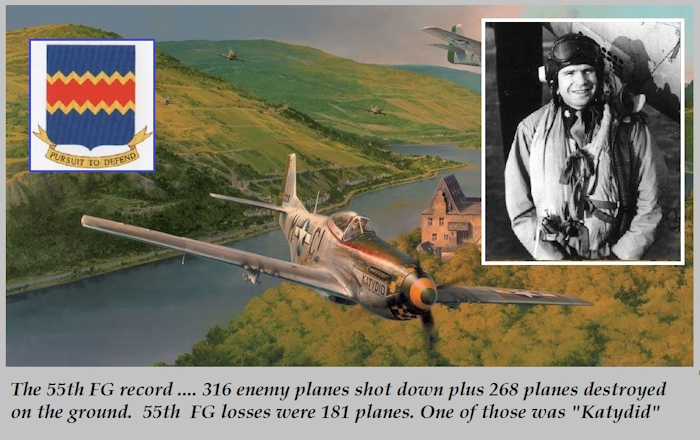 Murdy of the 361st FG. "PEG O' MY HEART II"
The figures above represent two P-38 pilots that flew with the 370th FG, 402nd SQ, based in England. On the left is Lt. Cy Coenen. 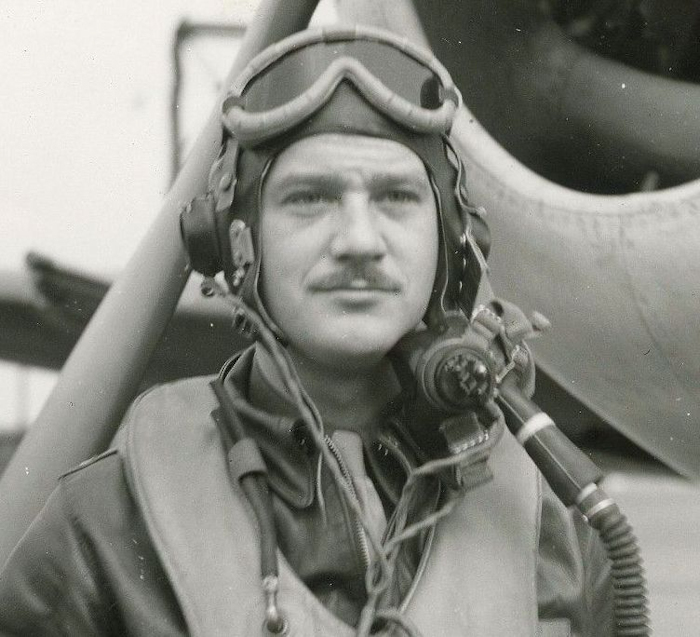 Two excellent wartime photos of Lt. Coenen show him in full flight gear. Over his shirt and trousers he wears the AN-6550 flight suit with an A-2 jacket over that. The white silk scarf is around the neck. His boots are the RAF 1940 pattern. His gloves are the RAF 1941 pattern with the RAF silk/rayon white liner gloves. The Mae West is a B-3 under the B-8 chute. A First Aid Kit is tied to the harness upper right chest area. His head gear is the RAF C type helmet with American receivers taped into the rubber ear cups with Mk VIII RAF goggles on top. On the forehead area of his helmet, he has a leather name tag sewn in with his name stamped into it. 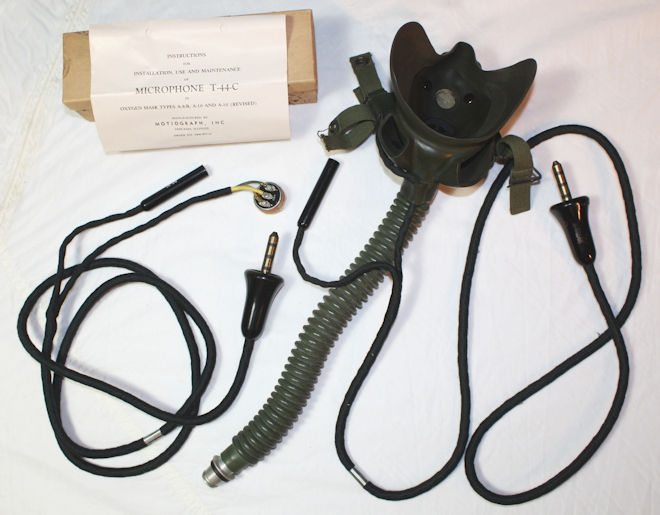 The A-14 O2 mask hangs from the helmet equipped with the T-44-C internal microphone with the large RAF "bell" shaped plug for the radio. All these items, except for the tape on the helmet earcups and leather name tag, are shown above. The figure and items displayed on the right is based on a wartime photo of the C.O.of the 402rd. SQ, Major James Tucker. In the wartime photo, he is standing in front of his P-38 named "Margie II". 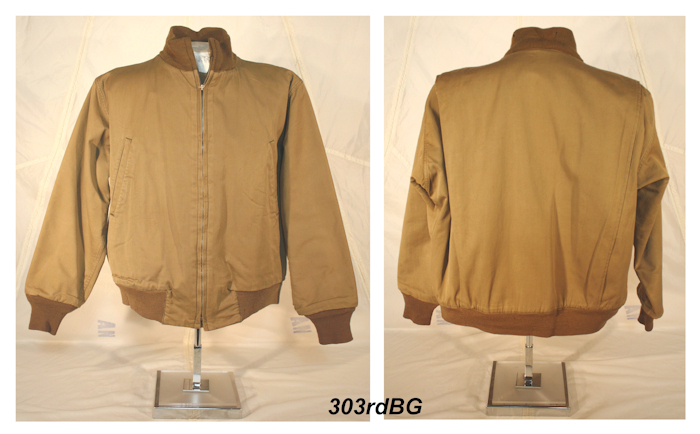 He wears the B-10 jacket with the classic whistle attached to the zipper pull. A white silk scarf is wrapped around the neck as shown and the classic crusher officer's cap sits beautifully on his head. In the photo, his hands are in his pockets. I'm sure his flight gear was identical to his friend Lt. Coenen. The gloves shown above are the B-3As. Major Tucker had a wife and 2 young kids waiting for him at home but never made it. 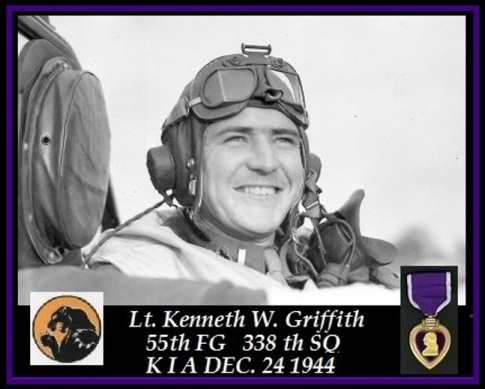 On August 10, 1944, while strafing a target in France, ground fire set his plane on fire and he crashed into a field. 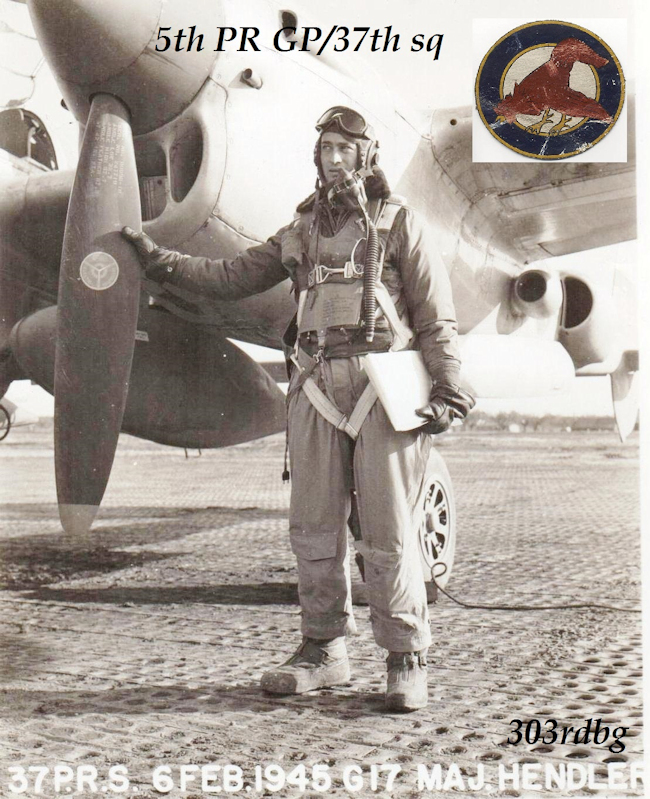 In September 1944, Lt. Coenen got a chance to use his B-8 chute over France after ground fire hit his P-38, named after his wife "Peg of My Heart II". 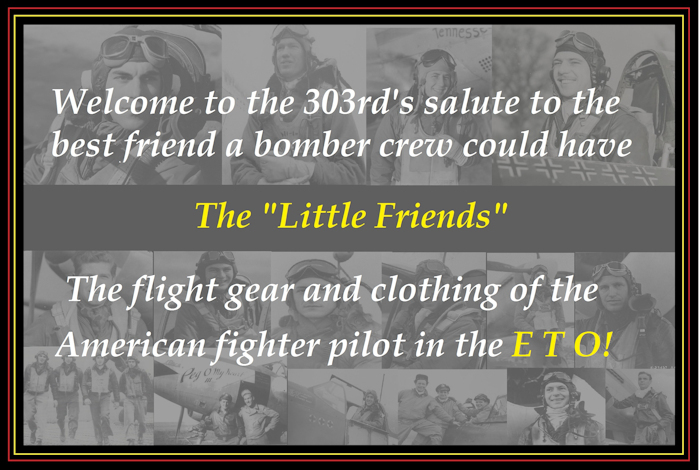 There's more to their story in the book "The 370th Fighter Group in World War II" by Jay Jones (Schiffer). Shown above is Capt. 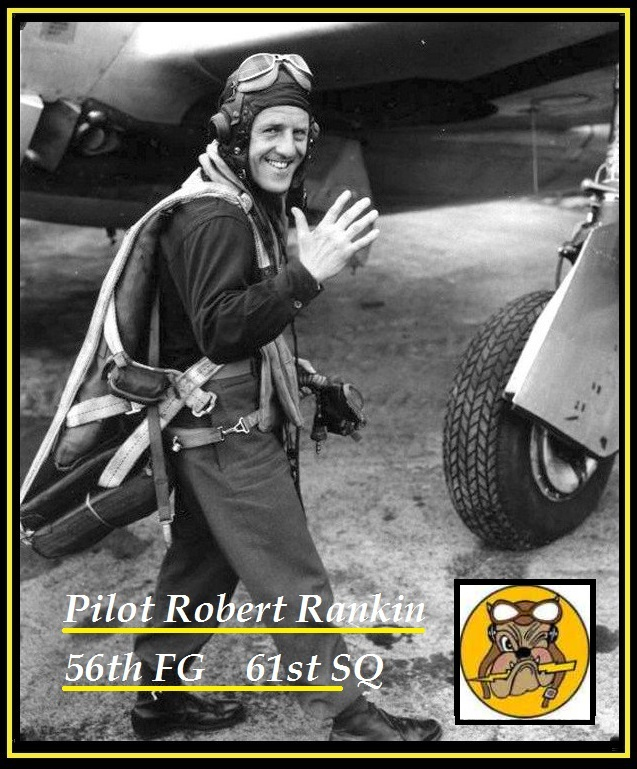 Robert Rankin of the 56th FG. 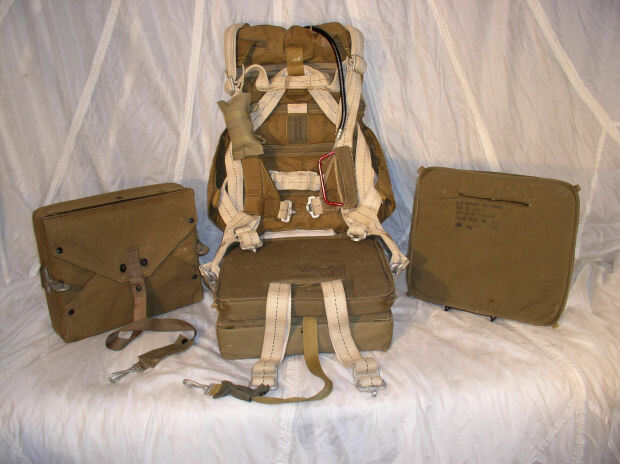 His parachute rig is a seat pack style which has the RAF type B pack which contains the RAF type K Dinghy (life raft). The seat cushion is the earlier black rubber type with the parachute below it. A zippered first aid pack can be seen attached to the harness. In the next photo you can see the same set up from the opposite side. Shown above is Lt. Lance P. ludwig . He is equipped with the same parachute rig as Rankin. From this side you can see the shape of the compressed air cylinder that would fill the dinghy and also get an idea how cumbersome the rig is in its entirety. Just climbing into the plane and then finding a comfortable spot took some time. Lt. Ludwig's three victories shown near the cockpit were 3 ME-110s. 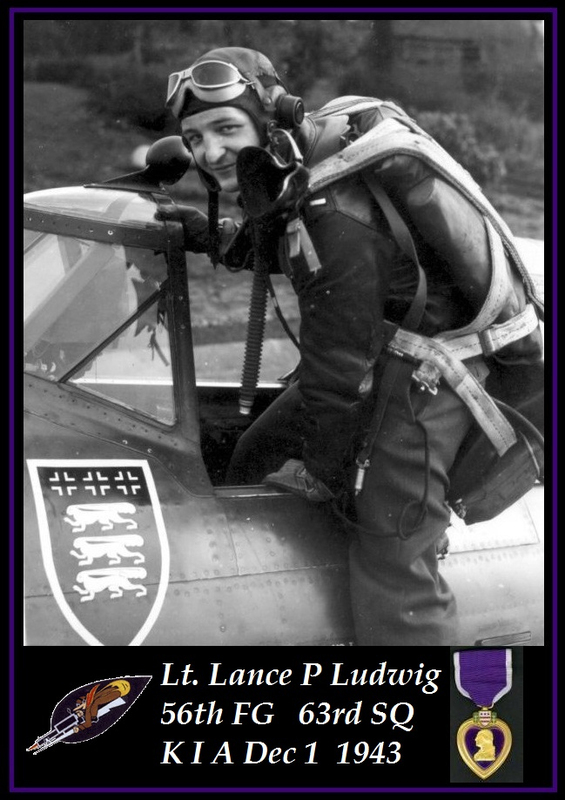 Lt. Ludwig was shot down and KIA Dec. 1 1943. Shown above is William Davenport. His parachute rig is shown clearly. Here you see a much improved Dinghy/parachute relationship. Tied to the top of the parachute is the type C container for the type K dinghy. One drawback was they now had to sit on an uncomfortable dinghy and co2 bottle. Like Ludwig above, Davenport has his T-44 Bell plug placed in his pocket. They both are wearing C helmets with 6530 goggles and A-14 mask. Shown above is Lt. Deeds of the 353rd FG 350th SQ. As more (Back) B-8 parachutes were issued the combination shown above was about as good as it was going to get. As fighter groups moved across the channel and flew from bases on the continent, dinghy's and mae wests were needed less and less. 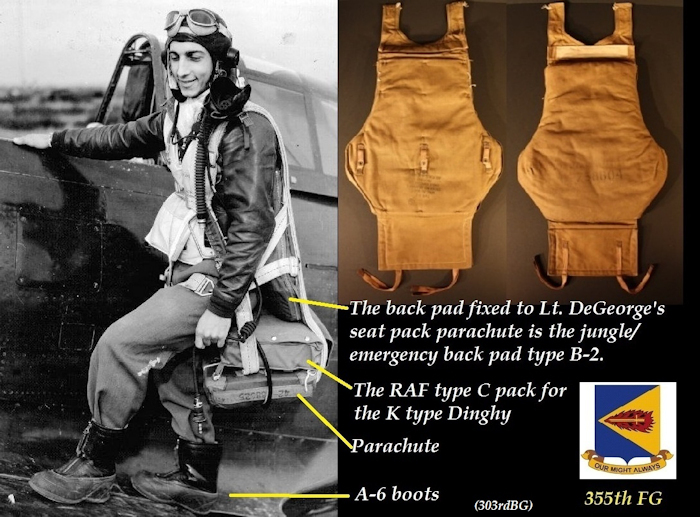 Lt Deeds is shown wearing a B-8 parachute with a cushion placed on top of the type C dinghy. 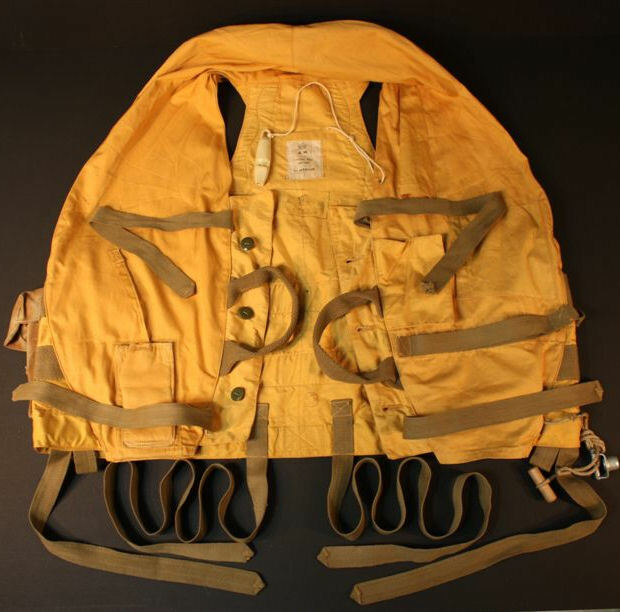 A life jacket dye marker is present on the strap of the B-3 life preserver. Like so many pilots he has added tape to his T-44 bell plug. (F-24) Shown above and below are pilots who have the B-2 parachute back pad attached to their harness. It is identified by the zippers on each side that join the two halves of the back pad. Shown above you see the front and back of the B-2, and below it is shown opened. It was originally designed to be an emergency survival package. 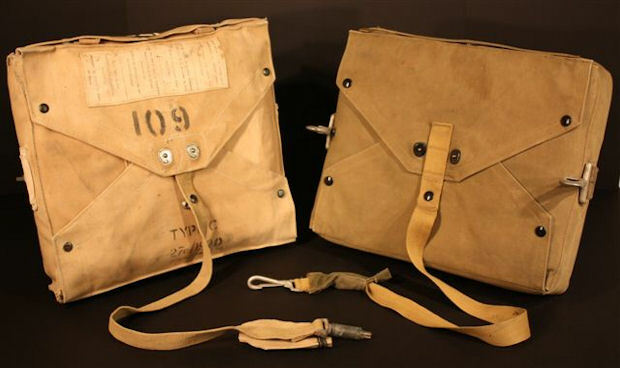 You can see the empty pouches of various sizes which were intended to hold a variety of basic survival items. It was the sort of survival kit more suited for aircrew bailing out over jungles in the Pacific and south east Asia than the harsh (?) conditions of bailing out over the French countryside in summer. 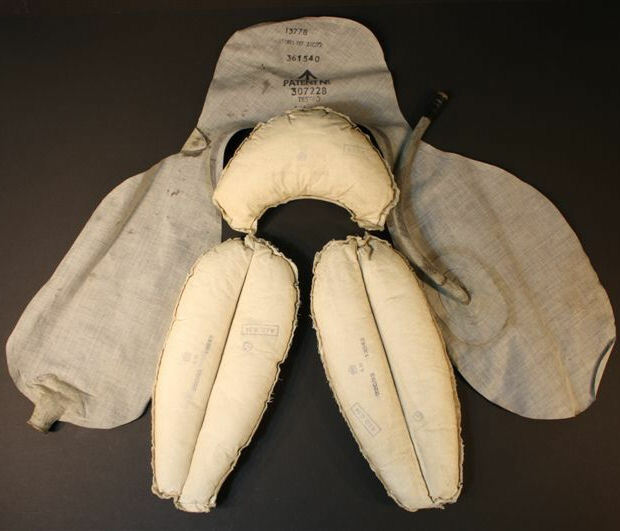 I see very few of these and they may not have had any of the supplies in them, but simply may have been a more comfortable back pad to wear. (F-25) Above is the typical fighter pilot rig -- the B-8 chute with the seat cushion on top of the dinghy. The seat pad is shown separately on the right as is the Type C dinghy on the left. Note the two hooks on the side of the dinghy that connect to the parachute harness. The long line with the hook on the end was to clip on to your Mae West. (F-26) Shown above is Lt. Hanzo of the 20th FG, 79th FS. In his right hand he carries the type C RAF dinghy (life raft). The white patch seen on Hanzo's raft is shown in greater detail in my photo above. Directions on how to deploy the raft are written in 4 different languages: English, French, Polish and Czech. 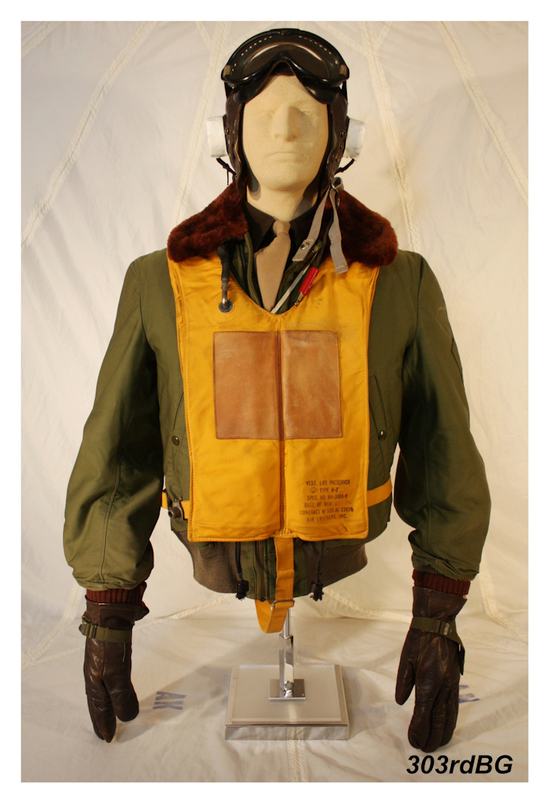 He's wearing the tanker outfit as well as 5 items of RAF origin, all previously described at top of the page. Lt. Hanzo was shot down and captured February 11th 1944. 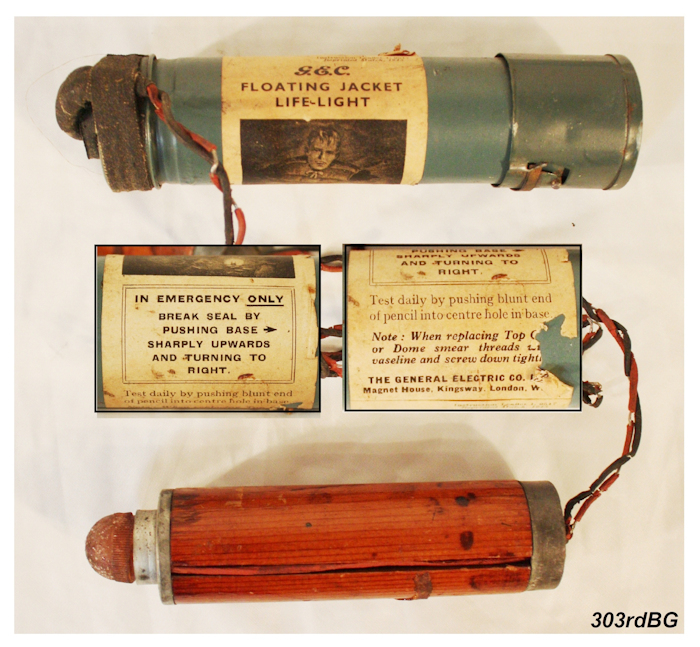 (F-27) Shown above left is the RAF K dinghy (life raft) pack, type C. Directions for opening the pack are shown in 4 different languages . On the right is the American version of the RAF pack, the C-2 life raft. The RAF version shown above has the similar hooks, but are placed on the opposite side. 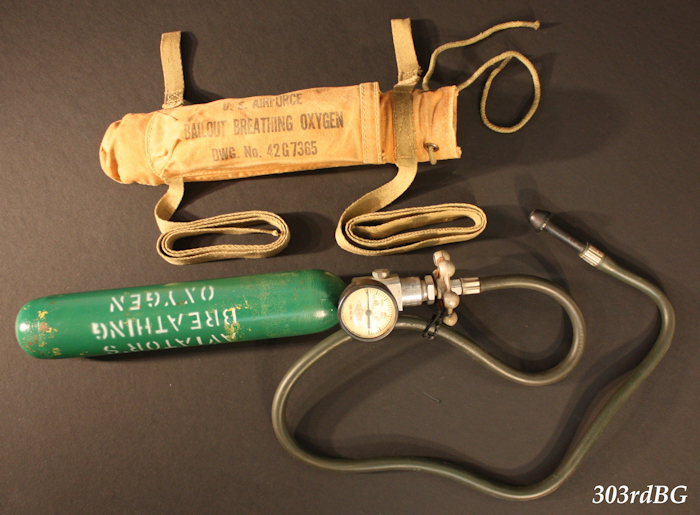 (F-28) Shown above is a well used RAF life preserver complete with kapok, bladder (stole) and the chrome charging handle. Name on vest is Peter Saunders serial # 3011910. This vest has no pouch or pocket for the signaling light. (F-29) Shown above, the 3 snap flap has been pulled down to reveal the chrome charging handle. (F-30) Shown above, in the background, is the bladder (stole) complete with charging handle installed. Insert photo shows CO2 cylinder extracted for display. 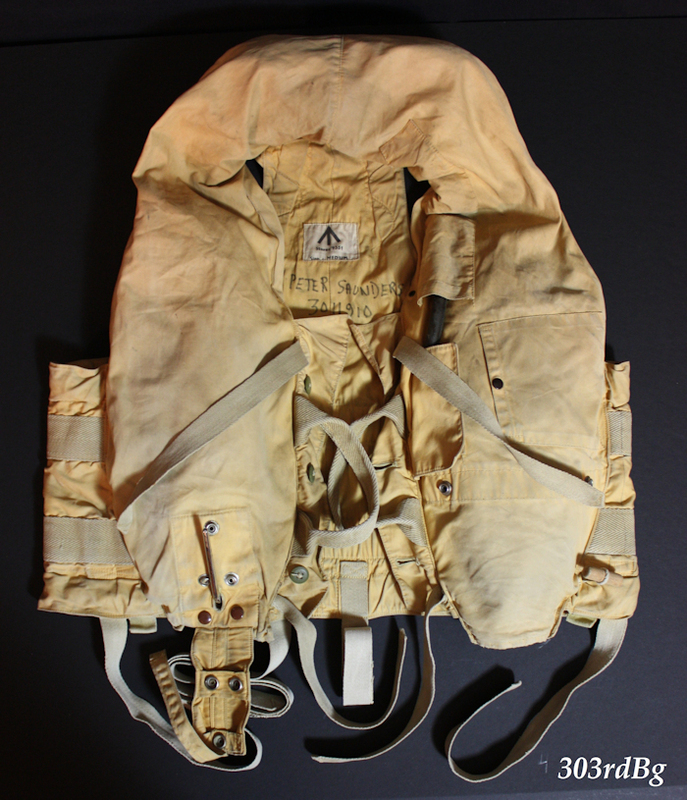 (F-31) Shown above is the 1941 pattern RAF life preserver. It is photographed with the two items shown below removed. This life preserver is easy to work with, and easy to repair and clean. It is easy to put on and more comfortable to wear than the rigid, stiff U.S. B-4 Mae West. When searching for one to own, you should be aware there are several types of labels. They are always white and have either the broad arrow or the AM (Air Ministry) with crown symbols. My example shown is incomplete and is missing the chrome lever that triggers the CO2 charge. 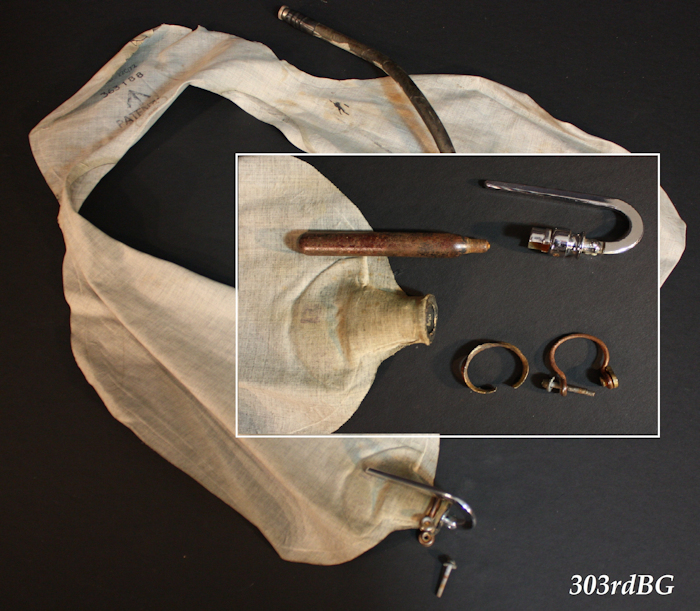 (F-32) Shown above is the bladder (stole) and the 3 pieces of Kapok that slip into the 41 pattern life preserver. These items are easily installed through a zippered opening at the rear of the neck.